Thus, you won´t be able to avoid doing your own calculations. Admittedly, it is not possible to do those manually or with help from a calculator for a single loan part with irregular paybacks, let alone a large number of credits. You won’t be interested in individual credits (I personally own more than 2000 shares of 5-10€ on bondora), but in the average value. 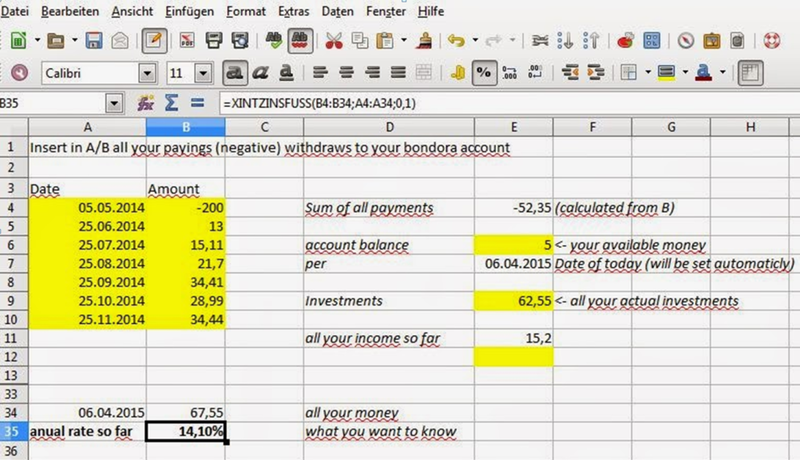 The calculation becomes possible by using a spreadsheet application such as Excel or the free LibreOffice Calc. It is “only” necessary to keep track of the respective cash flow (which is easier when the provider offers an own account for cash), and assume a sensible residual value. The program takes care of the rest. In this example (using a German version of excel), you enter all bookings into column A; the respective amounts into column B. In the process, incoming amounts are reckoned negatively, outgoing amounts (which actually leave the account) positively. Further calculation take place in the right half of the spreadsheet. Here there are just the current (cash) bank balance and the remaining value of the investments. Of course, you can calculate and consider corrections caused by overdue/failed investments. =XIRR(B4:B34;A4:A31 ;01), so here, simply the rows of all amounts and respective dates are being shown. The last value is an estimation for the yield (0.1=10%). That only plays a role when a negative yield is expected. Without it, the calculation won’t work. So it only necessary to have the discipline to enter all bookings in order to have an overview of all your yields.